Around 15 months ago, Luke had the difficult task of telling the owners of Stratum's Siren that she had bowed a tendon during track-work. He told them that she would have to be spelled for a lengthy period of time and that the injury may have brought her racing career to an end. However, with 11 months in the paddock, patience had its reward and Stratum's Siren was able to commence work to see if her leg would stand up to the strain of racing. Luke took her along slowly and her leg handled the pressure of track-work. The next step was to start her in a race, which the stable did at Wagga on the 4th of March. Stratum's Siren ran a very creditable fifth in her return and today took the ultimate step at Albury in the Benchmark 60 Handicap over 1175 metres. Stratum's Siren sat in the middle of the 12 horse field on settling and jockey Nick Heywood allowed her to coast around the turn so as to not put pressure on the leg. On straightening, Nick let her go and she powered home to win by a half-length on the post. The 6YO mare has always shown ability, but is lightly raced because of her injury. She has now won three races with four seconds and a third from only 15 starts. 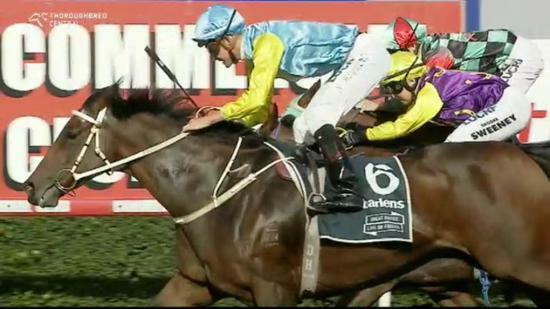 Congratulation to the owners who have shown faith in the mare and we trust she will go on to win more races for them.